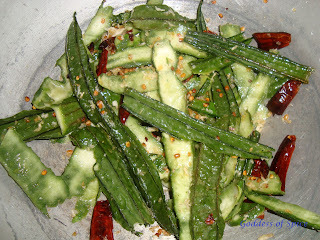 I have made Peerkangai Thogayal very often but I had no idea that the skin of ridge gourd could also be used for the same till I read this guest post from Nutmeg! 1. Peel the the skin of the ridge gourd. The vegetable can be used for something else, we'll just be using the skin for this recipe. 2. Heat a tsp of oil in a pan and add urad dal, dry red chillies and coconut. 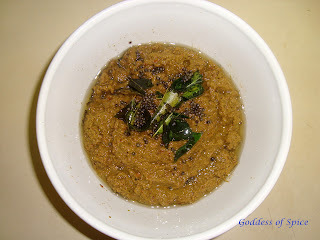 Once the urad dal and coconut become golden brown, add the ridge gourd skin and cook till it becomes soft, stirring occasionally. Spicy thogayal is ready to serve with white rice or you can serve it as side to rasam, sambar or curd rice.